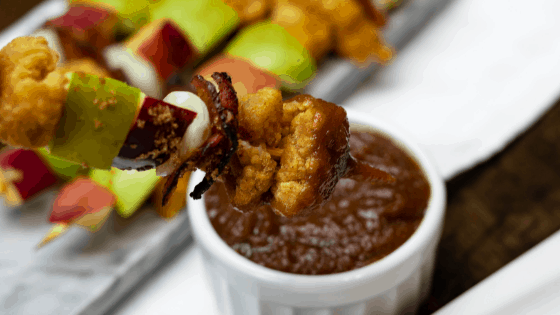 I made this Apple Butter Barbeque Sauce to go with my Popcorn Chicken Apple Kebabs. It’s the perfect appetizer to serve if you’re still craving Summer but looking forward to some Fall flavors. I love the delicious and fresh flavor that apples bring to the table. Adding apples as an ingredient into a barbeque sauce recipe was purely genius! It was delicious! It pairs wonderful with chicken and it s great addition to Fall gatherings. Place small pot over low heat. Add apple butter into pot and add in brown sugar. Let simmer over low heat until brown sugar is melted. Add in remaining ingredients and allow to heat for a few minutes. Pour into dipping bowl and serve. I bet this would be great in a slow cooker chicken or pork recipe! Glad I found it.